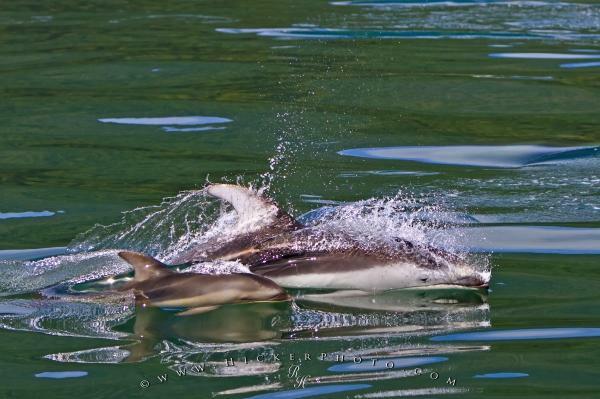 Pacific white sided dolphin mom cruising in the sheltered waters of Knight Inlet in British Columbia, Canada. Knight Inlet seems to be one of those places where dolphin mom's like to hang out with their baby's. We often run into smaller groups of maybe 30-50 animals on our Wildlife & Scenery tour on the way to see bears. While we normally looking for bigger groups of pacific white sided dolphins in other inlets, we always stop and have a good look at them anyway. BUT, we prefer to give mom's with baby's all the space and peace they need to raise their little ones. Wild Pacific White Sided Dolphins, mother with baby, travelling with high speed in the waters of Knight Inlet, British Columbia, Canada. Please find more info here: Wildlife & Scenery Photo Tour. Pacific white sided dolphin mom with her baby cutting through the surface at high speed, BC. Pictures from photo gallery "Knight Inlet Phototour"
This picture is part of the photo album "Knight Inlet Phototour" - there are more beautiful images waiting for you.